Marbury v. Madison was one of the most important decisions in U.S. judicial history, because it legitimized the ability of the Supreme Court to judge the consitutionality of acts of the president or Congress. 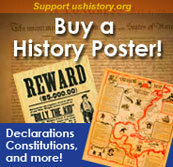 The Democratic-Republican victory in the 1800 election began a long run of Republican political success. In spite of Federalists' departure from most elective offices, they remained a powerful force in American life especially through their leading position among federal judges. In the final months of Adams' administration he enlarged the federal judiciary and appointed many new judges. In the view of Gouverneur Morris, a Federalist senator from New York, this created an independent judiciary necessary "to save the people from their most dangerous enemy, themselves." In sharp contrast, Democratic-Republicans were appalled by the "midnight appointments" that tried to continue Federalist influence despite their election loss. In Jefferson's view, the Federalists "retired into the judiciary as a stronghold . . . and from that battery all the works of Republicanism are to be beaten down and destroyed." As in so many areas, the two political parties fundamentally disagreed. 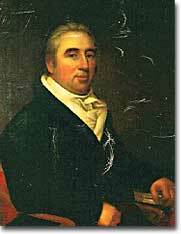 William Marbury: the plaintiff in the landmark Marbury v. Madison case. The most influential of Adams' final judicial appointments in 1801 was naming John Marshall as Chief Justice of the Supreme Court. He held that position until his death in 1835 and shaped the court's decisions and dramatically raised its stature. He also defined the basic relationship of the judiciary to the rest of the federal government. His forceful actions as Chief Justice set the Supreme Court on a course it has continued to follow for the next two centuries. Marshall was guided by a strong commitment to judicial power and by a belief in the supremacy of national over state legislatures. 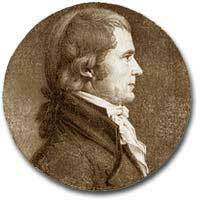 His judicial vision was very much in keeping with the Federalist political program. John Marshall's earliest landmark decision as Chief Justice came in Marbury v. Madison (1803) and demonstrates his sophisticated leadership of the Court. The issue at stake was the validity of the Federalists' last-minute expansion of the judiciary in 1801, but Marshall used the case to make a much broader statement about the relationship between the distinct branches of the federal government. When James Madison, Jefferson's secretary of state, refused to deliver several commissions for new justices, they petitioned the Supreme Court to compel the executive to act. Marshall's written decision on behalf of the unanimous Court found that the petitioners were entitled to their commissions, but refused to take the legal action that they wanted. Rather, the court declared that the Judiciary Act of 1789, which had given the court such power, was inconsistent with the Constitution and therefore invalid. This 1808 engraving of John Marshall, one of the most powerful men in the history of the U.S. judicial system, was done 7 years into his nearly 35-year term as Chief Justice of the Supreme Court. This was a complex decision. In the specific matter before the Court, the decision limited judicial power. However, the more fundamental issue that it decided was to insist on the court's authority to declare an act of Congress void if found to be in conflict with the Constitution. As Marshall explained, "it is emphatically the province and duty of the judicial department to say what the law is." Since Marbury v. Madison the Supreme Court has been the final decision maker regarding the Constitutionality of Congressional legislation. The Marshall Court, and this decision in particular, established the principle of "judicial review" whereby Congressional laws and executive actions may be judged by the Supreme Court to be within the bounds of the Constitution. In keeping with John Marshall's Federalist views, he generally favored strong government action and especially supported the supremacy of the federal government over state authorities. This student generated site has a great introduction to understanding the federal court system. It is accompanied by a compilation of landmark Supreme Court rulings, a tour of a murder trial, links to learning about the law, and a provocative summary of controversial issues including the death penalty. Cornell Law hosts this database of decisions and schedules for the Supreme Court's current term. All decisions since 1990, as well as the collection of 300 historical decisions, are searchable by topic. The Association for the Preservation of Virginia Antiquities presents a brief summary of John Marshall's many roles, from Congressman and Secretary of State to Supreme Court Justice. This work in progress from Northwestern University is a Supreme Court multimedia database. Take a panoramic tour (requires QuickTime plug-in) of the Supreme Court, learn about current and past justices, and search cases by subject or date. This promises to be a superior site when completed. John Marshall gave the Supreme Court its bite.